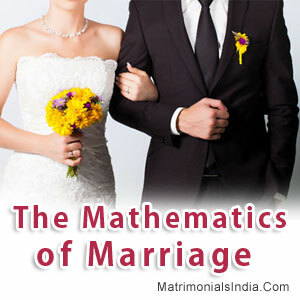 The Mathematics of Marriage[/caption] No doubt, Indian marriages are an extravaganza of pomp and show. However, underneath these big, fat marriages, there lies a set of sacred customs and rituals, of which the seven vows or the saptapadi are one of the most imperative rituals. With each vow, the couple makes a lifelong commitment, in front of the holy fire and amidst the chanting of religious mantras, to lead an eternally blissful married life together. Those seven vows and their particular significance are listed below. 1st Vow : Nourishment Bride and groom take the first pledge that they will provide each other with prospered living, and together they would provide nourishment and food to their family and household. They ask for almighty's blessing to make them able to nourish their family. 2nd Vow : Strength The second vow is to develop physical, mental and spiritual strength for each other to live their life with respect and harmony. The bride and groom promise to share happiness, provide eternal love and enjoy life together. 3rd Vow : Prosperity In the third step, the couple promises to earn a living with honesty and to increase their wisdom and wealth with uprightness to lead a satisfied and happy life. The bride also pledges to remain a loving and chaste wife, while the groom promises to respect and love his wife. 4th Vow : Family The fourth vow is to respect the elders of each other's family and to strengthen and maintain their family relationships. Also, they promise each other to acquire happiness and harmony by mutual understanding and faith. 5th Vow : Progeny The fifth vow is to ask blessings from God to provide the couple with beautiful, kind and brave children. The two promise each other to be responsible parents by imparting good education and moral values of life. 6th Vow : Health With the sixth step, the couple prays to God to bless them with a healthy, harmonious and disease-free life. Together they pray for longevity of their marital relationship and well-being of their families. 7th Vow : Love & Friendship Last but not the least, the bride and groom accept each other as lifetime partners to make their marriage blissful. Also, they promise each other to remain a loyal companion and strengthen their relationship with mutual trust, love and friendship. Though a Hindu marriage is an elaborate ceremony that contains numerous rites and rituals, but these seven vows are the most important of them all. After these vows, the married couple touches their elder's feet to seek their blessings to lead a happy and prosperous married life.